Our Norfolk Chrysler, Dodge and Jeep car parts department has a comprehensive selection of car parts and accessories at competitive prices. We have tires, mufflers, rims, brakes, mirrors, gauges, air conditioning parts, floor mats, transmissions, engine parts, bumpers, grilles, and hoods – everything your vehicle could ever need. The Cornhusker Auto Center auto parts department is ready to serve all your needs for Chrysler, Dodge or Jeep auto parts in Norfolk. With our huge parts inventory, we probably have the part you need in stock now. If we don’t, we can get it quickly. Order your parts right now by using Cornhusker Auto Center’s online parts order form. Take a look at our auto parts specials for current discounts on a selection of parts and accessories for your Chrysler, Dodge or Jeep vehicle. 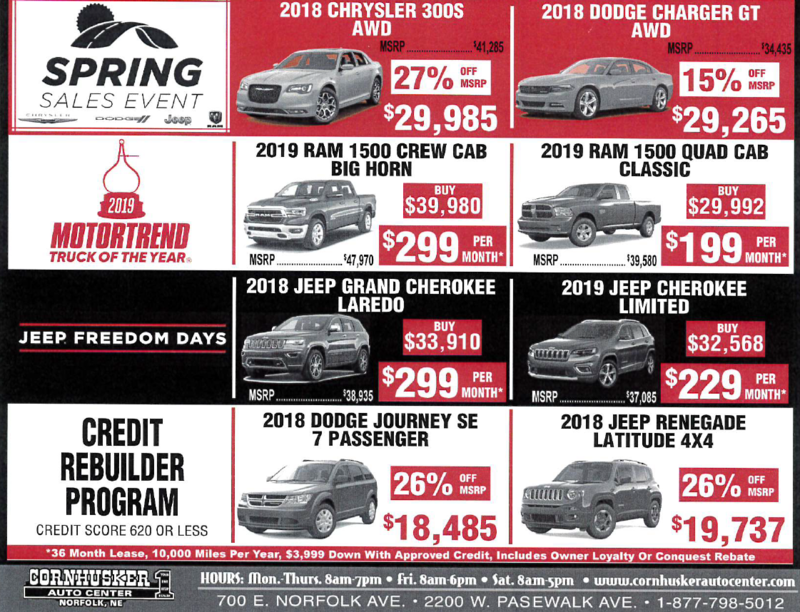 Stop by our Norfolk Chrysler, Dodge and Jeep dealership at 700 East Norfolk Ave. If you already know the name or number of your desired part, please fill out our online form to place an order. Our staff will check availability of the part and get back to you with pricing, via your preferred method of contact. Once confirmed, we’ll order the part and can either ship it to you, or hold it until you pick it up in our store.